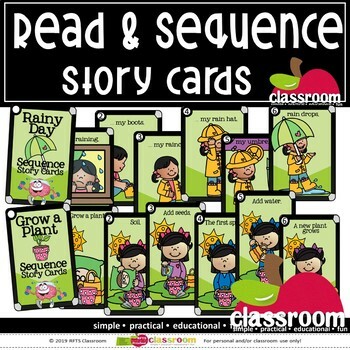 Read and Sequence Story Cards (48 cards total). 6 story card sets with 8 cards each. Students read and sequence story cards in proper order and in numerical order using numbered story cards. Print out cards, Laminate for durability! 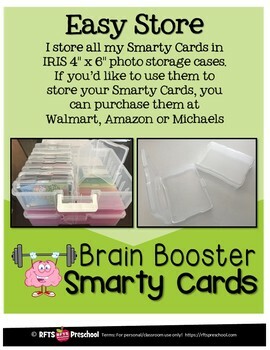 I would recommend storing your Smarty Cards in IRIS 4" x 6" photo storage cases. INTRODUCING SMARTY CARDS! This set is part of larger Smart Card Growing Bundle. Smarty Cards are large (4x6 in.) 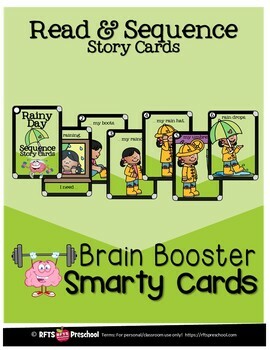 Brain Boosting Flash Cards designed to help students with learning letters, beginning sounds, matching patterns, counting, sorting, comparing, sequencing, rhyming, reading and much more. Students gain an understanding of early math and language skills while having fun! The perfect answer for independent starters, early learners, kindergarten prep and group interactions. Check out the preview to discover more details about this product. RFTS Preschool products are exceptionally easy early learning fun for the preschool age child. My hope is that you will enjoy using the materials and products as much as I enjoyed developing and creating them for you. If you enjoy this RFTS Preschool product, please stop back and let me know. I appreciate your feedback, comments and suggestions. 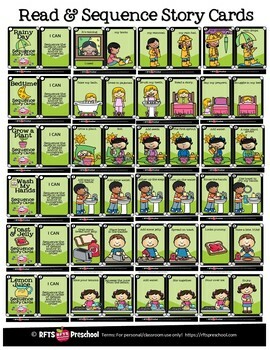 Keywords: story cards, numbered, sequence, numerical order, memory, preschool, pre-k, prek, kindergarten, childcare, RFTS Preschool, RFTS, RFTS PreKinders, RFTS PreKindergarten, Robyn Birge, Reach for the Stars.